FEATURES/SPECS Made of solid glass, this timeless desktop alarm clock will add a unique flair to any office. It features a smoked glass body with an arched top. The body houses a floating clock with a large white dial, black roman numerals and luminescent hour and minute hands. A silver alarm hand adds a unique accent. 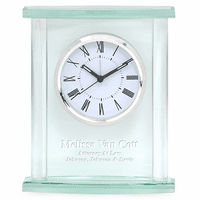 A solid glass base and solid posts complete the unique look of this clock. 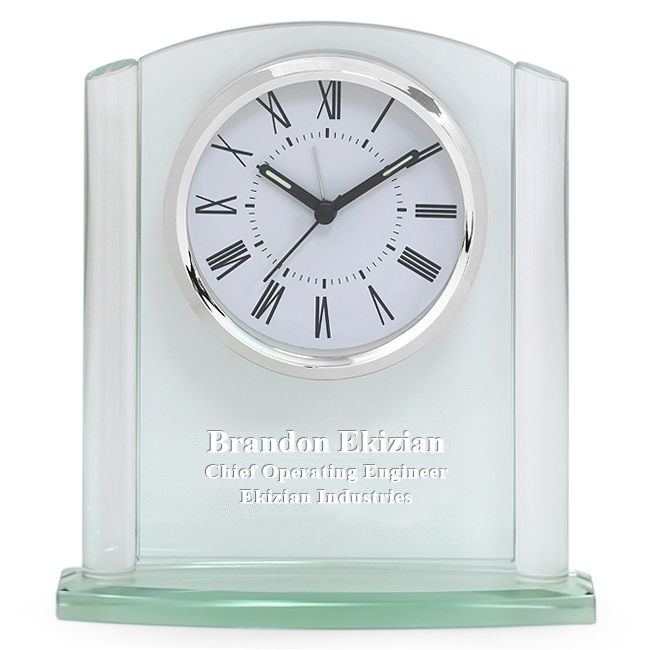 Add free laser engraving to the glass area below the clock. The engraving creates a solid white print that stands out beautifully on the glass. 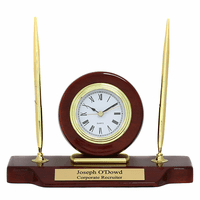 This personalized desk alarm clock is ideal for corporate awards, business gifts and even special occasion gifts like birthdays and anniversaries. Dimensions: 5 3/4" x 6"
Am I able to put my businesses logo on this clock with the works "Liz Smith - 5 Years of Service" below the logo? 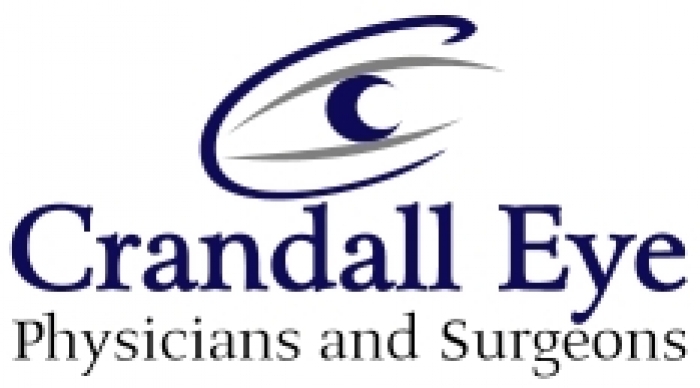 My business logo is very simple so I am hoping that it is not a problem (I have attached it below). Yes, we can. There is a five piece minimum order. Go ahead and place your order online. Put the word "LOGO" on line one of the personalization field and any other engraving you'd like on the other lines. You'll receive an email after your order is finalized. Reply to that email with the logo. We'll email you a proof for approval or editing within 24 hours. If our corporate logo has blue in it, can that be etched into the clock? No, sorry, the engraving is laser etched into the glass so it only comes out in white. When I preview this item the text is in green. I would like the text to be white like in the example. What color will the text be? Sorry for the confusion, the text will be in white. Is a laser etched into the glass producing a frosty white appearance. What do you give a new chiropractor for his office warming? 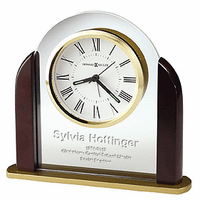 Luckily, we found this desk clock and it was perfectly inscribed with his name and new title. He loves it! The clock makes a beautiful presentation, and the engraving is nice. I received wonderful customer service and the product is beautiful! Exactly as it looked online. My item was excellent quality, price and was delivered in 3 days. Excellent experience, will order from this site again.